Apartments in Brisbane’s multi-billion-dollar Queen’s Wharf ­development will start selling in the 2019 financial year for the first of the three planned towers across the site. One of the Chinese development partners in the Destination Brisbane Consortium, Far East Consortium, announced the anticipated 2019 financial-year launch in their end-of-financial-year statements released this week. The Brisbane apartment market remains challenging but the central business district is home to only four of the 47 projects set to settle by 2019, according to property consultant Urbis. It is expected that the Queen’s Wharf apartments will launch on to the market after a lull in high-rise development in the city ­centre. 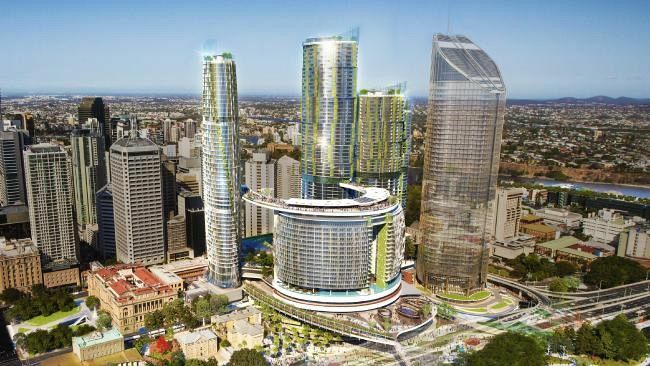 The $3 billion Queen’s Wharf development will have three residential towers, comprising about 2000 apartments, spread across the 13ha riverside casino and leisure precinct. The Australian understands the residential component of Queen’s Wharf was granted a development window until 2035 to complete, dependent on market conditions. The first 67-storey tower is forecast to provide 259,000sq ft (24,060sq m) of saleable floor area — subject to the final plans — that is expected to bring in $HK1.104 billion ($186 million) as reported by Far East. The second 63-storey tower will be of comparable area, and the third 50-storey apartment high-rise is expected to provide almost double the floor space. The gross floor area of the apartment space, across three towers, is forecast to be 167,000sq m and about 2000 units across the total development of 544,600sq m.
The Far East Consortium will target the middle-class Chinese market. “The group will continue to adopt a ‘Chinese wallet’ strategy and pursue opportunities arising from the anticipated increase in the outbound tourist numbers from Asia,” it said. Far East has a joint venture with Hong Kong-listed Chow Tai Fook for the residential component. Brisbane’s CBD has several projects approaching settlement in 2017 and 2018: Sunland’s $140m Abian tower, the 176-apartment first stage of Billbergia, AMP’s 1000-unit Sky Tower and Consolidated Properties’ 340-apartment Spire tower.